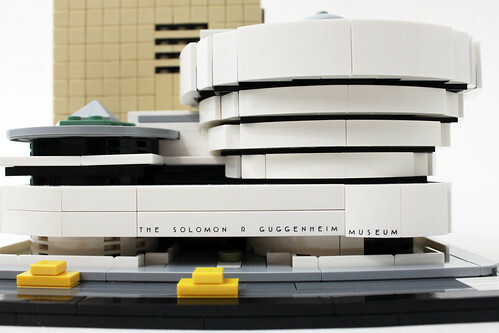 LEGO has just released their newest LEGO Architecture set with the Solomon R. Guggenheim Museum (21035). 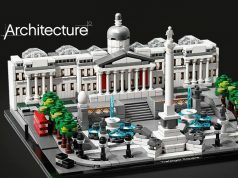 The set has 744 pieces and retails for $79.99 which is roughly about $0.11/piece. 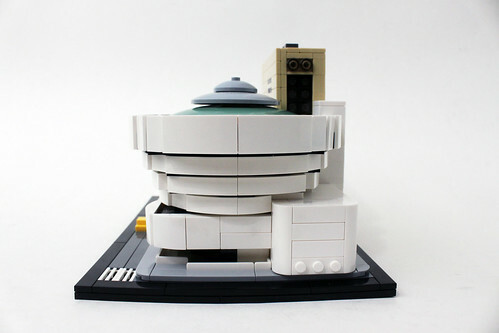 This set is a updated version of the on 2009 version. 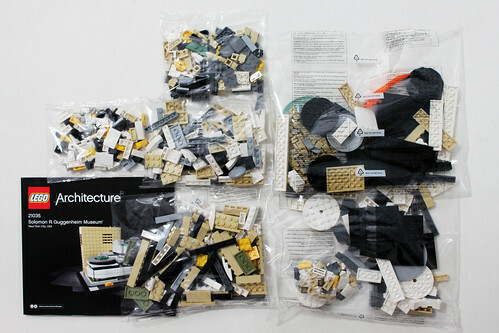 The contents of the box include five unnumbered bags and the instruction booklet. 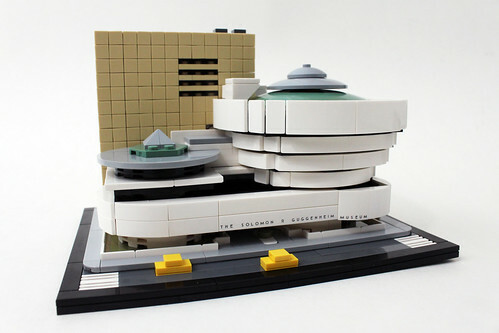 As with other LEGO Architecture sets, the front of the instructions give some details about the Guggenheim Museum designed by Frank Lloyd Wright and the story about the iconic building in New York City. 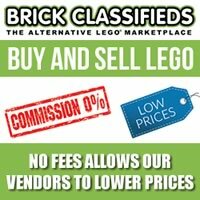 Throughout the build, there are more facts included on the top right corner of various pages. Since the bags are not numbered, it may be tempting to just go old-school and dump everything in a big pile and start building that way or do what I did and poured everything in the box. 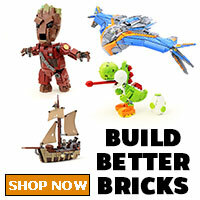 I highly suggest not doing that if you just want to get the build quickly done because it look me more time than I should to complete. 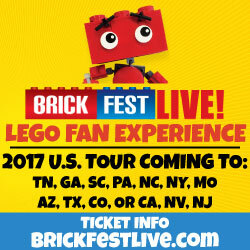 The whole set uses somewhat more advanced building techniques such as SNOTing and also offset part placements. The main thing that sticks out for me here is the rotunda which Wright calls an inverted ziggurat where the spiral grows larger as the levels go higher. 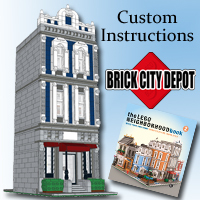 To get the round look, the section uses bow pieces connected in the middle with Travis bricks while the corners use a new 1×1 brick with 2 studs on adjacent sides along with 1×2 chesse slopes. 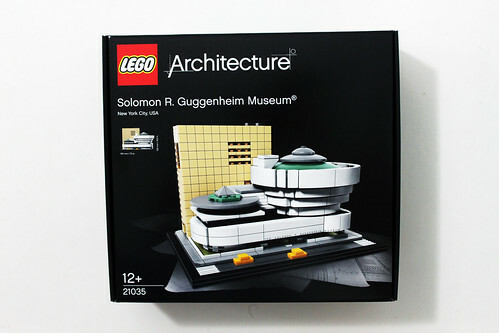 The front of the Guggenheim also uses SNOT to attach the long plate which has a 1×2 printed tile for the words, “The Solomon R Guggenheim” that sits above the entrance. 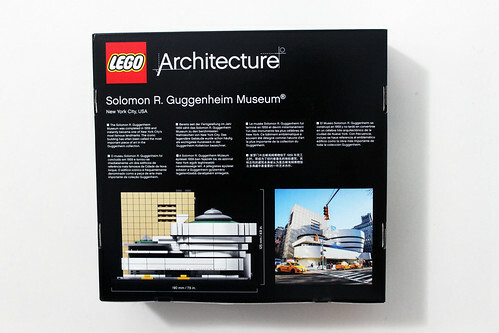 There’s also a printed 2×2 sloped piece with the word “Museum” that sits above the corner of the building. 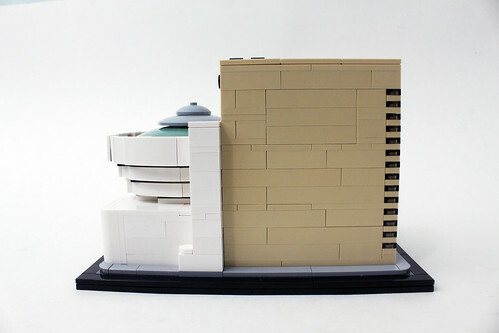 On the left side of the building, the smaller rotunda uses some of that offset technique that I spoke of earlier. 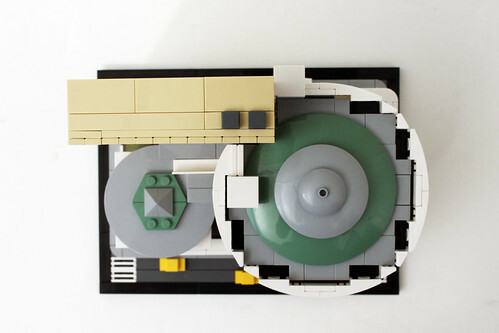 At the base, it stacks three white 6×6 round plates on top of the olive-green tiles. Near the roof, there are some new 6×6 round plates in black with a Plate Ø63.84 on top. There’s some new 2×4 wedge plates in sand-green that goes on top of that with sloped pieces to finish off the roof. 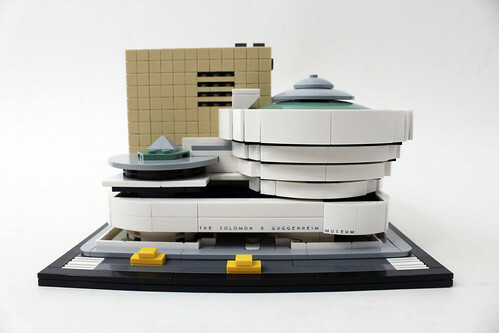 In 1992, there was a tower adjoining behind the Guggenheim and we also have that in this set. 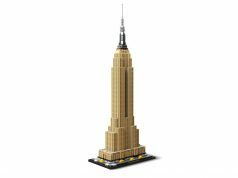 The final result of the tower seems to be just 1×1 tiles on the front side but there’s more to that underneath which uses a very intricate SNOT technique. The boring and OCD inducing part here is to make the 1×1 tiles straight as there are 102 of them on this side of the tower. 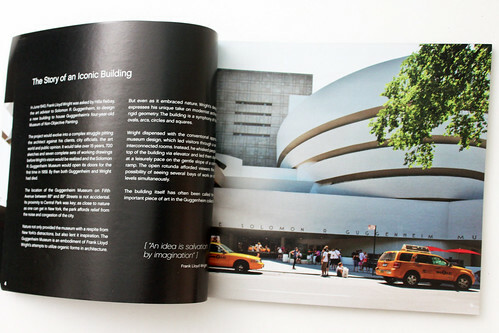 There are also trans-black pieces used to represent the windows and they look very nice incorporated with the tan. 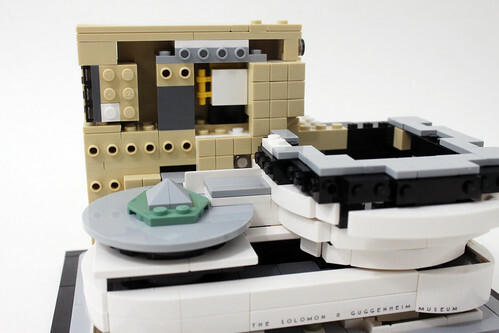 There are also some little details that make the set a complete one. 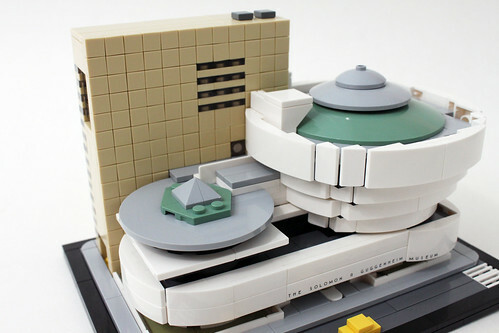 One of which is on the back side of the set where we have the elevator that goes to the upper levels of the museum rotunda. 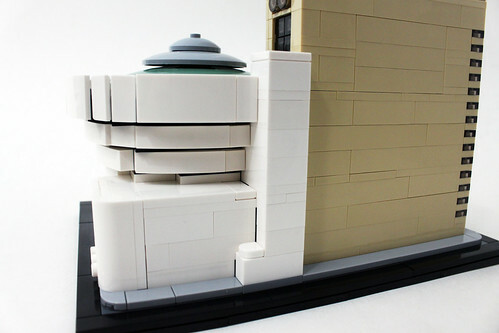 In front of the Guggenheim, we have a couple of yellow 1×1 tiles on jumper plates which represent the yellow taxi cabs of NYC. 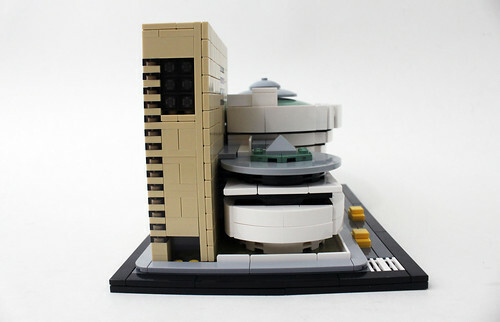 The updated LEGO Architecture Solomon R. Guggenheim Museum (21035) has 500+ more pieces that it’s predecessor and not surprisingly, it has a lot more accurate details than the previous version. The building process of it was fun and engaging especially with all the interesting building techniques involved although I wish I didn’t dump every bag into a single pile. 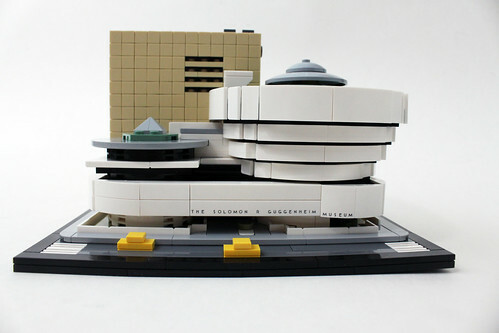 The LEGO Architecture line appeals to those who want something simple yet sophisticated at the same time and I feel that fans of the theme will appreciate this updated version of the Guggenheim.